A PLANNED "state of the art" livestock facility near Mount Larcom has a goal to become "future proof" and save millions of dollars every year. 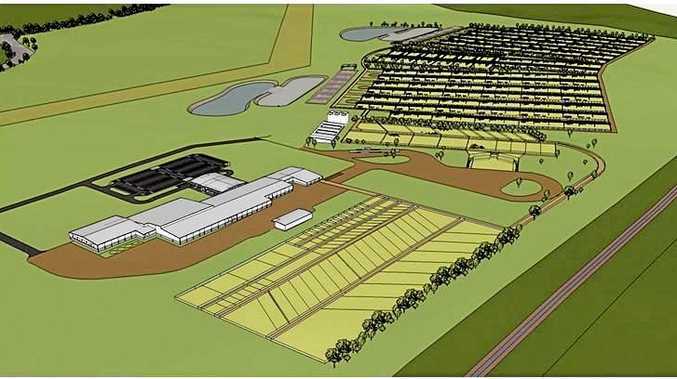 Asia Pacific Agri-Corp (APAC) has revealed its plans to be wholly-powered by renewable energy at its proposed Euroa Livestock Export and Processing Facility to prevent the development from suffering financially from electricity costs. Published in a business case about the solar, battery and hydrogen infrastructure it hopes to build, the company expects to spend about $100 million on a solar farm and car park roof topped with solar panels. The renewable energy production also includes a hi-tech plant to produce 1,000,000 kilograms of hydrogen a year. "The facility will use approximately 44.4GWh of electricity annually, at a current market cost of approximately $4.9 million," it said in the report. "Energy consumption of this magnitude exposes the development to electricity price risk which is accentuated by recent and forecast continuing electricity price hikes." The energy resourcing report, prepared by Pitt and Sherry on behalf of APAC's Dan Daly, said the company wanted to invest heavily in hydrogen, describing it as the "fuel for the future". It wants to construct a Hydrogen Electrolyser Plant on-site to produce hydrogen to fuel heavy vehicles, which leading Australian scientists including the CSIRO have trialled in Australia since 2004. "APAC is constructing an innovative and leading practice facility that will future proof the business against utility and fuel price increases and maximise renewable energy use," it said. "This process includes the introduction of major technological infrastructure in both industrial hydrogen and oxygen production together with fuel cell operation." The Gladstone State Development Area proposed project, 12km west of Gladstone, would create 380 jobs during construction and 335 jobs once built. The company was formed specifically for this project, and it has an office in Calliope. The hi-tech abattoir would be the third purpose-built beef processing facility constructed in Australia in the past 60 years. At its peak it would process 2400 head a day for export to China.